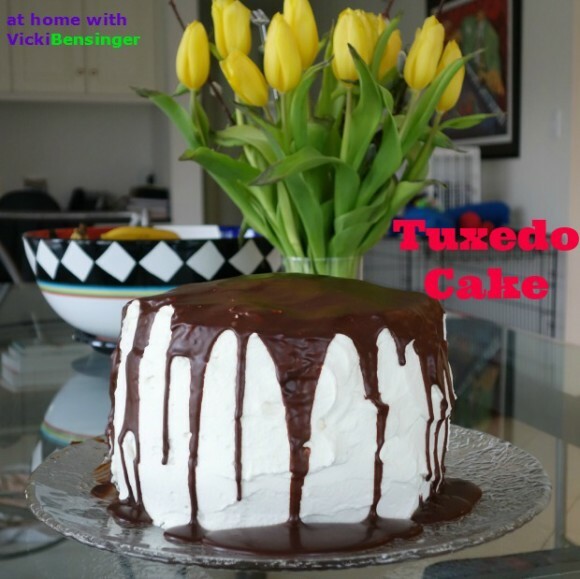 If you’re a follower of At Home with Vicki Bensinger, then you know I love mile high birthday cakes. My birthday was last Monday, March 31st. Since my son was traveling, I decided to wait until he returned so we could all celebrate my birthday together. Birthdays are a big deal to me, and I always like to do it up chocolate, so to speak, for my husband, kids, family, and me! After all, at least one day out of the year everyone should feel extra special. I’ve been searching for a cake to bake for my birthday for about a month now. 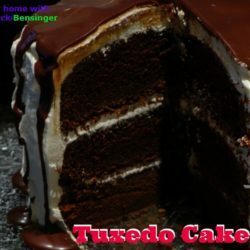 I must have had a list of 10 different cakes to decide from, but finally narrowed it down to this Tuxedo Cake – a recipe from Rather Sweet Bakery & Cafe, owner Rebecca Rather. Although this recipe takes a good 5 hours from start to finish, most of that is resting, and refrigeration time between baking, frosting, and glazing. 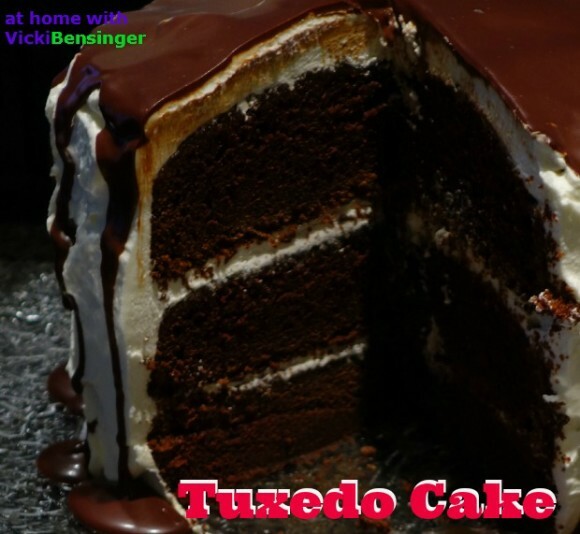 Besides that, the Tuxedo Cake is a cinch to make, and WOW does it taste sensational! Surprisingly it isn’t too sweet, but just right. It’s the perfect blend of ingredients leaving your sweet tooth totally satisfied. Whether you’re celebrating a birthday, anniversary, holiday, or just want to make a cake – this one is a keeper, and will please everyone at your table. 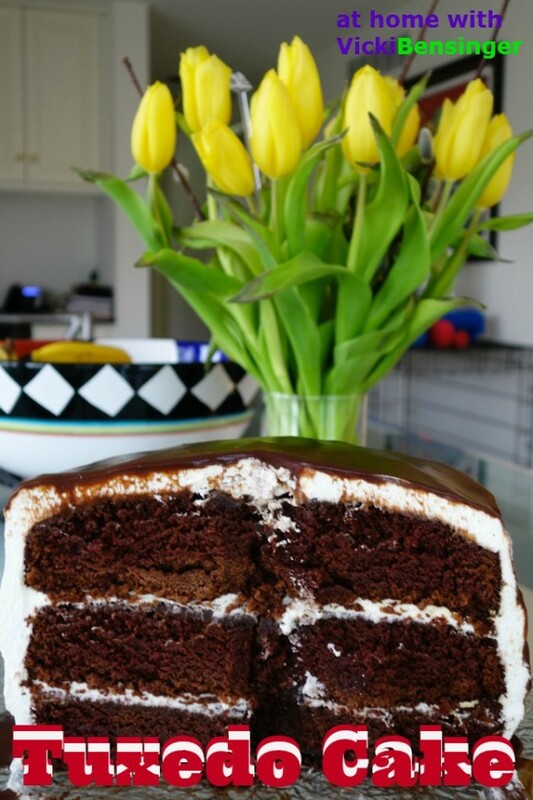 For a mile high cake, make 3 layers or if size doesn’t matter go with 2 layers. 1. CAKE: Preheat the oven to 350 degrees F.
Line the bottom of two 10-inch cake pans with parchment paper rounds, grease with non-stick cooking spray, and dust with flour. Combine the butter, water, and canola oil in a medium saucepan set over medium heat. In a large bowl, stir together the sugar, cocoa, and flour. Pour the butter mixture into he sugar mixture and whisk until smooth. Whisk in the eggs, one at a time, then whisk in the buttermilk. Whisk in the baking soda, salt, and vanilla all at once. Transfer the batter to the prepared pans. Stagger the layers on the middle rack of the oven with one placed more toward the front of the oven and one toward the back. Bake for 35 to 40 minutes, or until a toothpick inserted into the middle of each layer comes out clean. Monitor the layers carefully for doneness; each one may be done at a different time. Remove the cakes from the oven and cool on racks for about 15 minutes before inverting onto baking racks. Cool the cakes completely, at least 2 hours, before frosting. speed until soft peaks form. Add the powdered sugar and whip until thoroughly combined. Place 1 cake layer on a platter and spread some of the frosting over the top. Top with the remaining layer, thickly coating the top and sides of each with frosting. Refrigerate the cake until the whipped cream frosting has stabilized, at least 1 hour. 3. CHOCOLATE GLAZE: Place the chocolate in a medium bowl. Heat the cream in a small saucepan over medium heat until it is very hot and just beginning to steam. Pour the hot cream over the chocolate and stir until it has melted completely. Stir in the syrup and vanilla. Pour the glaze into a medium pitcher or measuring cup and let cool for 10-20 minutes. Do not let the glaze sit longer because it will stiffen and become difficult to pour over the cake. Slowly pour the glaze over the cake, ensuring that it covers the top and drizzles down the sides. Cover the top of the cake entirely, but make sure some of the cream frosting shows through the drizzles on the sides. Refrigerate the cake until the glaze is set and the whipped cream frosting is firm, at least 1 hour. Slice the cake with a long serrated knife, dipping it in a tall glass of hot water between each slice. The refrigerated cake will keep for about 2 days. Happy belated Birthday, Vicki. The layered cake looks sensational! I agree Perfect for Easter or anytime. It’s not too sweet but just right. Yes and we all celebrated by eating this until it was gone. It was delicious! Happy Birthday! And what a spectacular cake you selected to help you celebrate! This looks awesome — really good stuff. Thanks for this. I bet you ate it all in a night! Oh Vicki, size always matters… where cake is concerned. Three layers is perfect. I love this cake and it’s perfect for a birthday. I hope it was really happy.